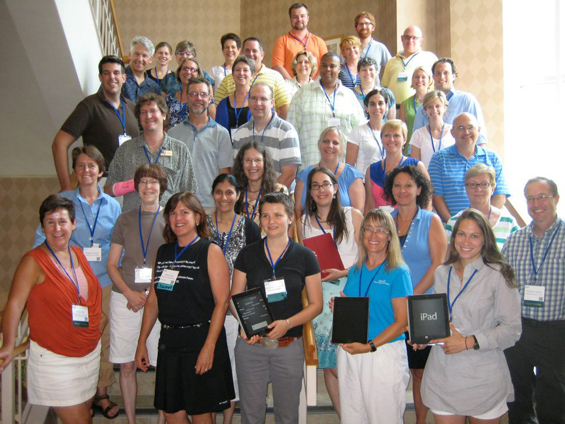 Middle and high school educators attending the ESIP Teacher Workshop in Madison this week will be the first to borrow one of thirty iPads from the CIMSS iPad Library. The first of its kind, the library is spearheaded by Margaret Mooney, CIMSS outreach coordinator, funded by the NASA Global Climate Change Education program, and managed by the Schwerdtfeger Library. This unique program will offer science teachers the opportunity to borrow an iPad for the entire 2012-13 school year, incorporating them into their science classrooms. Educators will attend several sessions demonstrating novel uses of Earth science tools and data, including the recently released SatCam app, so that they can return to their schools armed with ideas for the fall. The Federation of Earth Science Information Partners (ESIP) is a consortium of scientific organizations that collect, interpret and develop applications for remotely sensed data. This summer the ESIP education committee invited regional science teachers to meet in Madison, Wisconsin to learn about efforts to study and steward our planet. For more information, contact Margaret Mooney.